Confetti Flick Sticks | Shop at Flutter FETTI Today! If you want to add an element of excitement to your next celebration, our confetti flick sticks are the PERFECT way for you to get the party started! With just a simple flick of the wrist, our handheld confetti launchers shoot confetti high in the sky, creating a mesmerizing effect that your guests won’t soon forget! Whether you’re planning a wedding, a Bar Mitzvah, a graduation party, or a corporate event, you’ll have no trouble finding confetti flick sticks that coordinate with your color scheme. Not only do we carry a wide variety of in-house color combinations, but we also offer custom color confetti flick sticks that you can use to create your perfect combination. Confetti, Streamers, Bubbles & More! Our flick sticks are packed to the brim with many different kinds of confetti, including rectangular tissue confetti, metallic streamers, corkscrew confetti sticks, Metallic Streamers with tissue bubbles, Metallic Streamers with FETTI and 6” FETTI Strips. Each confetti design is unique in how it floats and flutters, and some of our confetti tubes include two different types of confetti in one! Our tissue FETTI is biodegradable and flame-retardant and our Metallic streamers are ideal for a fast clean-up. Since our Metallic Streamers conduct electricity please don’t use them outside where there are telephone wires. Our hand flick confetti launcher requires no Co2 and is pre-loaded with confetti/streamers at both ends, giving you two shots per tube. Some of our confetti flick sticks are designed to shoot FETTI 25-30 feet in the air, while others are only designed to reach 9-10 feet. 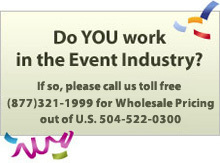 Our Confettiologists can help Double-check your selection to make sure it’s ideal for your venue. If you have any questions about our great products, or if you’re interested in our wholesale pricing, contact us today! Some Flutter FETTI products when saturated with any liquid and under pressure may bleed color, and Flutter FETTI® cannot guarantee or warranty that it will not do so. If any liquid will or may be present at an event, please consult with us so we can assist you in choosing water-safe FETTI® products.